The STS controller is the latest technology in shearline controllers.The KRB Touch Screen Provides several ways to control your Shearline. 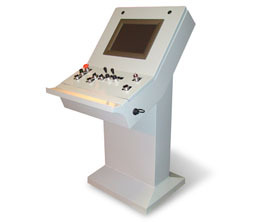 Manual quick cut is a single cut & unload stop entry for manual cutting similar to traditional toggle switch control consoles. This feature is perfect for "tags only" cutting. With minimal key strokes, the operator errors can be eliminated, compared to other shearline controllers. Manual multi-cut allows you to enter up to 10 lines & optimize; graph at bottom of screen shows visual binning of bar in pocket locations. The operator can scan, manually input or download a cut list and optimize before cutting. Allows for 100 lines of entry. Will optimize up to 5 different stock lengths and supports direct downloading of an optimized list.